The Amber presents as an open, spacious floor plan. 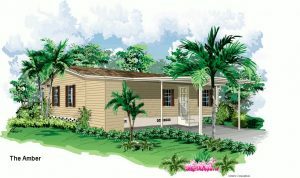 With bedrooms on each side, it is perfect for those that want to have some privacy and sanctuary. The kitchen and dining rooms feature enough space for a cook, and will surely be ideal for those that entertain. At just over 1000 square feet, the Amber is popular among our “snow birds” and our year round homeowners, who want to enjoy an affordable, active adult lifestyle.